She did fine, I suppose. She was animated and confident. She displayed an ability, for the first time since her convention speech, to repeat, with a fair amount of credibility, the formulations that her handlers had given her. You knew she was well prepared when practically the first words out of her mouth were "Go to a kids' soccer game ..." She had that folksy thing down  although I did notice, watching the squiggly lines down at the bottom of the CNN screen, that when she tried to get cutesy with her folksiness, it didn't work. 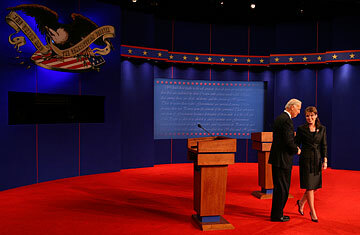 Indeed, Sarah Palin's high-energy performance in the vice-presidential debate was the most glaring demonstration  since George W. Bush's performances in 2000  of how little you can get away with knowing and still survive one of these things, especially if the rules limit the cross-examination as severely as they did in this debate. Her relentless opacity was impressive. She refused to answer the questions for which she hadn't been prepped with answers, and when Biden pointed out that an early question had been on deregulation, not taxes, she flashed: "I may not answer the questions the way you and the moderator want to hear, but I'm gonna talk straight to the American people." Talk straight she didn't, with only a few exceptions. She talked talking points. And when the talking points concerned areas in which she didn't know diddly, she didn't talk them very convincingly. Indeed, there were times I got the distinct impression that she didn't understand the points she was talking about (on the Vice President's constitutional powers, for example). Joe Biden, by contrast, demonstrated a real knowledge of the issues in question. He made several verbal fumbles  it was Syria, not Hizballah, that left Lebanon  and at times he lapsed into legi-speak, even using plague words like amendments and Liheap (the winter heating-oil assistance program for poor people). But his was a solid, informed and restrained performance  although his best moments came near the end of the debate (when much of America had turned to the baseball playoffs or reruns of their favorite sitcoms on cable). He was genuinely moving when he talked about being a single parent after the death of his wife (he almost began to weep but held it together); in fact, that moment was more real than anything Palin said all night. He also closed with a devastating point: McCain was, sure enough, a maverick on some things, but not on any of the issues that really mattered in this election  and he listed those issues, and where McCain stood on them, to great effect. It was striking to me  for the second time in two debates  that the Democrat got much the better of the argument on Iraq, especially if you watched the squiggly focus-group lines on CNN: it seems clear that people just want the war to end. Biden did marginally better than Obama on the substance of the issue, pointing out that the Maliki government agrees with Obama, not McCain, on the timetable to withdraw U.S. troops (which Obama failed to mention last Friday). That Palin made it through the debate without running off the stage shouting, "I can't do this!" should not obscure the fact that there was only one person tonight whom anyone with any sense  even John McCain, I imagine  would trust as President. Biden's performance was strong and, happily, gimmick-free. He used no gotcha sound bites, no consultant-driven silliness  a fact driven home by the lameness of Palin's snark lines like "Say it ain't so, Joe" and  pace, Gipper  "There you go again, talking about the past." Palin's problem, and McCain's, is that the recent past is crucial in this election. Bush's decisions over the past eight years  to go to war in Iraq, to neglect the war in Afghanistan, to aggrandize the rich and neglect the middle class  created the dreadful moment this country faces right now, and people know that. Fearful for their futures and the nation's, they seem to be looking for something differentand that something involves steadiness, knowledge and some clear ideas about what to do going forward, qualities that Sarah Palin did not display tonight. What she did show was some folksy charm and some energyqualities that might get her selected for Dancing with the Stars if not Jeopardy. But that's not enough to change the trajectory of this race, especially since nothing that was said in this debate will be remembered, or remarked on, a week from now.